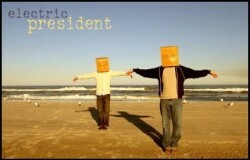 Electric President is an intriguing mix of Pop, Electro, and Indie. Their songs have some good beats and contain an excellent mix of sounds, both vocally and with their instruments and various electronics. One thing that is pretty neat about this band is how they use the lyrics to drive the music. The lyrics in some of their songs tend to have a staccato type feel to them, which kind of gives an off and on, start and stop feel to the music. It’s actually really hard to describe in words, so you’ll just have to listen to understand what I’m trying to say. Electric President has found itself compared to the Weakerthans, which on one hand, I can kind of understand. But on the other hand, the similarities aren’t overwhelming or all that numerous. Perhaps it’s the fact that ElectroPop isn’t a very saturated genre. Despite any comparison people want to make, Electric President is an awesome band with some very unique and enticing music. Do yourself a favor and check them out.